The foundation stone was laid in 1877 and a report in Building News (32 p364) implies T E C Streatfeild‘s plans were adapted from some he had made for a different but unspecified site. 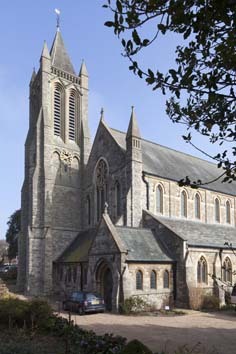 The church was consecrated in 1879 (BN 36 p704), before the tower and chancel aisles had been built. 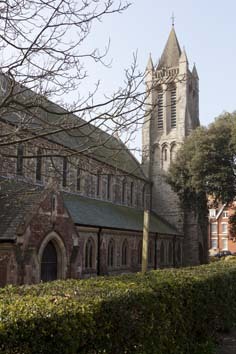 The former was finished in 1883 (1 p5), by when a new parish had been formed out of St Saviour and Holy Trinity (ibid p6). The large church, which unsurprisingly cost £19,000 (KD 1899), is faced with rough-cut stone. The tower in particular shows an interest in French gothic, with long twin bell-openings, their heads in gablets below the parapet. Behind this is a low pyramid spire of stone. 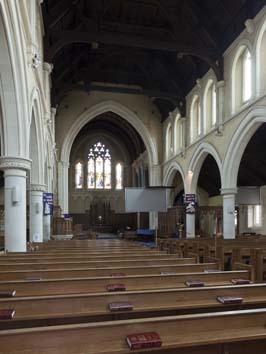 The spacious nave has five main bays behind a lean-to west narthex. By contrast, the chancel is short. Close examination reveals anomalies and some inferior detail, due to a fire in 1927 when everything except the tower and vestries was burnt out (CDG 83 (NS) p358). Quite a few changes were made during the rebuilding by P D Stonham and A R G Fenning, which cost £40,000 (Brown) and was completed in 1929. Fenning had already done unspecified work on the church, presumably lost in the fire (WWA 1914). 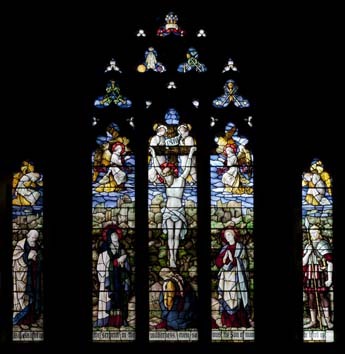 The rebuilding uses similar stone, but old photographs in the church show five east lancets in place of the present window with Decorated tracery, flanked each side by a lancet, and also a smaller west window below a roundel. The aisles were heightened by 3ft 6in (1 p16), altering the internal and external proportions. The arcades and tall chancel arch must date from after 1927, but like the rest of the rebuilding are fully gothic, with stiff leaf capitals and clustered shafts; possibly they reproduce the original design. 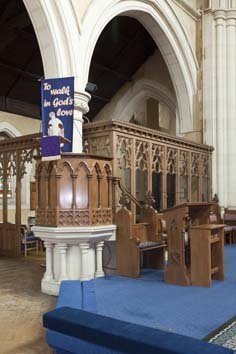 The chancel extends one bay west of the chancel arch, behind a low wall. A chapel is on the north side rather than the customary south one. The fittings all date from after the fire. In 2007 a new hall was opened adjacent to the church and linked to it. it is built of brick and the architects were CPL Architects (CBg 107 (Sept/Oct 2007)). Font: Octagonal with panelled sides and a partly open-work cover. Though it must date from after 1927, there is no sign that it is not 50 years older. 1. (All except one) Shrigley and Hunt, c1929 (www.stainedglassrecords.org retrieved 11/2/2013). 2. (North aisle, fifth window) R de Montmorency, 1961 (signed).